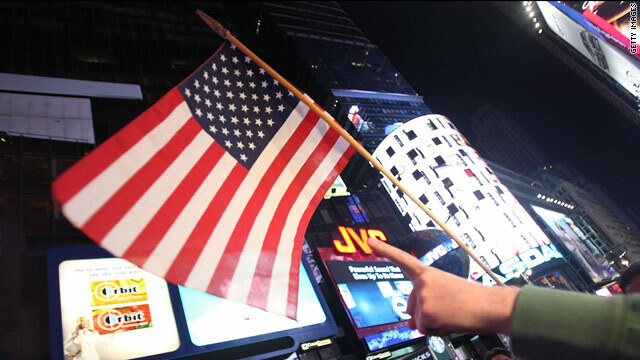 Thousands celebrated at Times Square in New York City early Monday after Osama bin Laden's death was announced. Is it morally right to celebrate bin Laden's death? (CNN) - Festive crowds gathered to cheer his assassination. Americans spilled into the streets for spontaneous celebrations after news spread that Osama bin Laden, the al Qaeda leader behind the 9/11 terrorist attacks, had been assassinated. Yet another reaction took place in more sober moments as people of faith watched the giddy celebrations with a tangled mix of emotions. Is it morally wrong to celebrate the assassination of bin Laden in such a festive, patriotic way? That’s the question that troubled Danielle Tumminio, an Episcopal priest, who fought back tears as she digested the news that bin Laden had been killed. Tumminio was in New York on September 11, 2001. Her Long Island neighborhood, filled with lawyers, stockbrokers and firefighters, lost scores of people in the attacks. But when Tumminio saw images of Americans celebrating, she felt something else: moral ambivalence. Jubilance, exaltation, revulsion - all those emotions mingled as people of faith struggled to find an appropriate response to bin Laden’s death. No one we interviewed for this story denied the importance of bin Laden’s death; the heroism of the American soldiers; the importance of serving justice. But religious leaders of different faiths say no one should rejoice in the death of a person, even a hated enemy. “As the rabbinic teaching goes, as the children of Israel were crossing the sea and the army of Pharaoh was drowning, God rebuked the angels for showing excessive joy,” Herzfeld says. Emad El-Din Shahin, a professor of religion at the University of Notre Dame, says the Quran also teaches reverence for every life, even the most repugnant ones. He says Islam stresses that the death of a person should be observed in a respectful and solemn way for all people, not just Muslims. He told a story from Islam to illustrate his point. The Prophet Mohammad was sitting by a road one day when a funeral procession came by. The prophet stood up out of respect, says Shahin. Shahin says most Muslims reject the notion that bin Laden was a Muslim leader. One Christian leader pointed to a biblical story from the life of Jesus. Scott Appleby, a history professor who studies the roots of religious violence at Notre Dame, said that when Jesus was surrounded by guards near the end of his life, one of his disciples picked up a sword. Some leaders say that dancing on bin Laden’s grave is wrong from an ethical point of view as well. “Killing someone should never be a cause for celebration or joy,” says Rick Halperin, past chairman of the board of directors of Amnesty International USA. The best reaction would be “somber reflection,” says Halperin, who is also director of Southern Methodist University’s Embrey Human Rights Program. Tumminio, the Episcopal priest, has already arrived at that place. She says she plans to preach a sermon about the appropriate reaction to bin Laden’s death. She’s still sorting through what she will say. There’s at least one sentiment she feels no ambivalence about. Bin Laden’s death should give the United States something else its citizens have craved since September 11, 2001. Osama was a terrible person. He killed thousands of innocent people. However, celebrating his death just isn't morally right. When the Muslims danced around on the streets when the towers came crashing down, we felt so mad. And now we're doing the same thing. Doesn't that make us hypocrites? I know, a lot of people feel so sad that he killed many of our family members. And now that he's dead, we can feel a good sense of closure and relief from the fact that he will never murder anybody ever again. But he is still a living creature, and killing living creatures is a sin, whether you're religious or not. Killing him was fine because he was a terrorist but the celebration of his death and the ecstasy it gave everybody was absolutely unnecessary. You don't have to mourn the guy nor do you have to go get drunk with happiness about it. Just be happy that the murderer is gone and out of our lives. I think it is morally wrong to celebrate the death of Osama Bin Laden. When the 9/11 incident occurred, many members of the Taliban celebrated it as a success. Americans reacted violently to this, becoming extremely mad at the fact that the Taliban celebrated this crisis. As a result, a lot of hate was channeled towards Middle Eastern communities living in the United States of America. If people celebrate Bin Laden's death, it would be the exact same act as the Taliban celebrating 9/11. In Taliban eyes, it would be extremely rude for people to celebrate the death of their "leader." Also, if people celebrate, the Taliban may react violently, likely inflicting more terrorism in the future. I believe that the fact that we are all celebrating Osama Bin Laden's death is not humane. Because no matter how bad a person's actions are, it is wrong to celebrate death. Yes, I agree that the celebration is not just about the murder of Osama, but also about USA's victory in the Middle East, and I agree that the celebration of war is ok. But I don't think that we should celebrate the death of a certain someone because I believe that death is a sensitive issue, and if we are celebrating death, then we are doing the same thing Osama was doing to begin with. The celebration of any death is not a virtuous thing to do, as said by Rick Halperin, “Killing someone should never be a cause for celebration or joy.” I agree that “The best reaction would be somber reflection”, no matter who the person is. American’s should feel proud and relieved that they finally got rid of their number one enemy after trying for 10 years, however, their extensive and continuous celebration is too much. Their celebration may cause them more threats and trouble in the future, because Osama Bin Laden is not the only villain out there. Bin Laden has been a public enemy for more than 30 years, he is the one responsible for over thousands of deaths, so people should not be blamed for their excitement and joy, however people should be more careful about their overreactions and the possible consequences. Yes, I am satisfied about Osama Bin Laden's death, but celebrating his death is very inappropriate. Actually celebrating anyones death is extremely impolite even if they could be one of your enemies. By watching the news it is hard to hear about it all because we are acting like fools. Parading in the streets is taking it a bit too far. Also half the kids that are American that I have talked to have come up to me and said something like, "Yay for being American". This doesn't help anything, but show how we are responding to his death. We shouldn't be celebrating his death as much as thinking of all those who have lost their lives in the incident or serving as troops. I'm not saying that Osama Bin Laden's death is bad because personally I am quite happy about it, but I do think that we could have handled the situation better instead of taking it too far. Yes, it is nice to hear that Osama Bin Laden is dead, but the fact that we are celebrating his death is definitely inappropriate. In fact we shouldn't be celebrating anyones death even if it is our biggest enemy. It is so hard listening to the news about all of this because we are making ourselves look like fools. Parading in the streets is taking it way to far. Also about half the kids that are American that I have talked to are coming up to me and saying something like, "Yay for being American". It makes us sound ignorant and really we should be thinking about all of those who are lost their live in the incident or serving as troops I'm not saying that Osama's death is bad, because personally I am quite happy about this, but we didn't act the right way about his death. But how can we celebrate the death of a man, no matter how notorious he was? When Americans began fighting this war, didn't we believe that we had the proper morals? At least compared to the Islams? Isn't that why we fought the war, to correct those who celebrate death and appreciate terrorism and its outcomes. The original intention behind this war was to serve and teach justice to those who didn't know justice. However, now that we are celebrating the death of a man, no matter how kind or cruel he was, it descends us to to the level of terrorists and Al-Qaeda. We no longer have the right to say that we are the righteous ones, the ones with the correct morals and ethics. How can we tell anybody to stop taking lives when we are celebrating deaths? Like an old chinese saying that states: "In order to have power in an argument, you must first not violate any laws yourself"
Yet, we are being the prime example of what we SHOULD not be, we have violated every rule there is to violate in the Christian Bible in regards to this situation. This time, we are the ones who are at fault. We are now the prime example of hypocrites to the rest of international society. The idea of somber reflection is correct. Now that the man is gone, we must reflect on his past wrongs, and determine to ourselves, each one of us as individuals, why these ideals were wrong. Then, we must take care to not repeat these mistakes ourselves. History has been recorded and learned so that we will learn and not repeat mistakes from our ancestors, and I believe that Bin Laden's actions and death should serve as a great lesson to all those who are celebrating and throwing parties over a man's death. To all Muslims who are reading this, I apologize for my natural and subconscious stereotyping. The celebrations on the streets were inappropriate to the point of vulgarity. It is one thing to be proud of and respect the bravery of the solider's who put their own lives in jeopardy to avenge the deaths of thousands who have lost their lives because of Osama bin Laden, but another thing entirely to celebrate his death. I don't think that his loss is a tragic one but celebrating death of any kind is fundamentally wrong. The way we have reacted to the death of our enemy says something about us; we must remember that when we have an enemy we make ourselves into an enemy as well, and we were horrified when our enemies celebrated in the streets because of 9/11 and yet now we are behaving the same way. Are we no better than the one's we hate? I am fairly certain that those who actually lost someone close to them are not partaking in drunken celebration but rather solemn reflection because though BIn Laden's death does not mend the loss I would imagine that it at least brings a sense of closure. Also, the "Obama: 1 Osama: 0" are tragically inaccurate. Bin laden was killed when Obama was president that is true, but Osama Bin Laden killed thousands and thousands of people. Although it seems reasonable to some to celebrate the death of someone who planned the death of over 3000 civilians, I personally think that this is not right since we're stooping down to their level of playing. Sure, it could be an act of vengeance and fulfillment to some people or the belief that justice is served for those innocent people. But when your actually celebrating the death of someone, it probably makes you feel disgusted inside.While you guys are busy celebrating on the streets, it probably caused a lot of Al-Qaeda hatred and enmity towards Americans and who knows, they may plan another terrorist attack because of your disrespect towards the dead. This cycle of hatred will definitely not end soon since as you know, there could be many people to take Osama's place as the head of Al-Qaeda and take revenge. I hope this meaningless celebration of the dead just end and that we can have some kind of self control so we don't have to repeat this kind of incident again and have this ongoing conflict. I think it is morally wrong for people to celebrate someones death because it would be inhumane in a way. The Americans (mainly New Yorkers) are happy of the death of Bin Ladden because of what Al-Qaeda done to New York on September 11. But when Obama mentioned "justice has been done" on his speech, it suddenly doesn't feel as though justice has been done but revenge. It feels as though the Americans are celebrating because thats what he deserves for bombing the Twin Towers, but referring to the Bible, doesn't it state that revenge is bad? What has Jesus and the Bible taught us? Many great leaders such as Martin Luther King made many good speeches on how revenge is bad. If justice has been done then surely the Americans could have captured Bin Ladden and trialed him, but instead, he is dead. Thats how justice is served. not tools of the noble-minded. finding no glory in victory. is to savor killing people. And victory too should be conducted like a funeral." "Why would we think our reaction would not be seen as (just as) disgusting behavior to them?” – Couldn't have put this any clearer. How could any reasonable person argue with this logic? So, is our nation chock full of unreasonable people? What a sad, disappointing commentary.